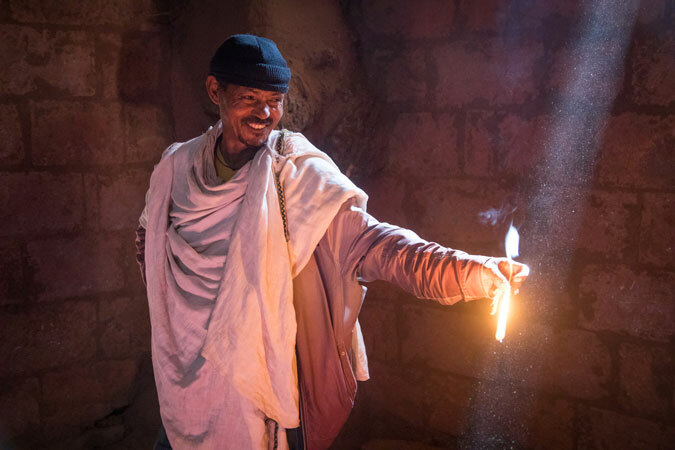 The labyrinthine world of Lalibela is one of the holiest Christian sites in Ethiopia. 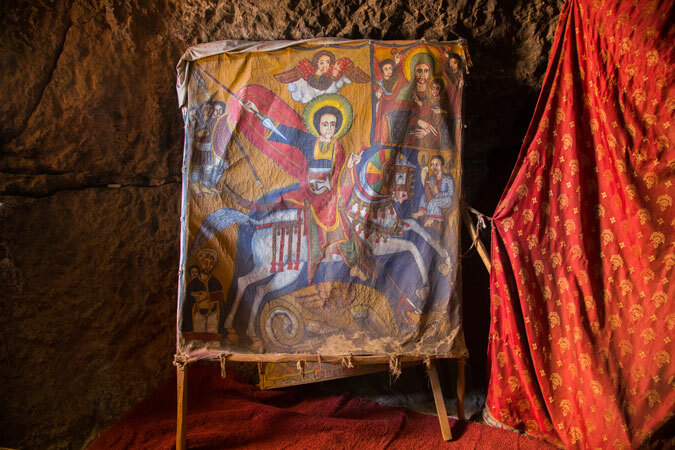 Home to 11 UNESCO-recognised churches carved from a single piece of rock, this site is a place of pilgrimage, and to explore Lalibela on foot is to follow a path made smooth by those who have visited it for over 800 years. 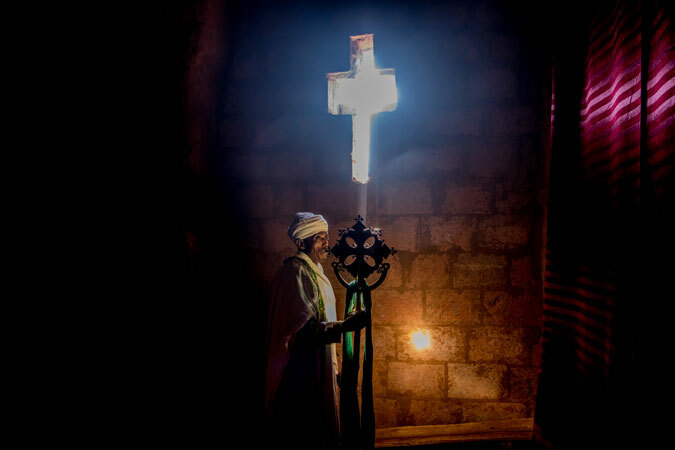 The churches in Lalibela are skillfully connected through a series of access tunnels. Priests preside over the complex and are committed to perpetuating the spirituality that has permeated the ancient walls for centuries. 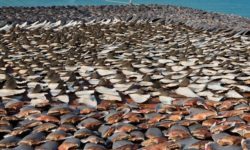 Which way do the churches face? UNESCO describes the complex as having two main groups of churches separated by a river. The complex faces west, so it is wise to visit both sides over two afternoon. 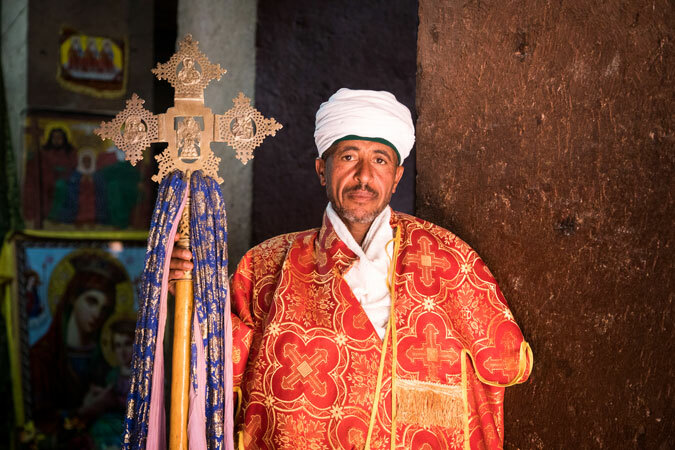 Unless you are a native speaker of Amharic, a tip would be to get a good guide who can help you with talking to Lalibela’s priests as many of them speak limited English. There is no formal information on the protocols required when visiting. I took my shoes off before entering each church and, as a woman, I covered my head with a shawl. There is also no formal communication about tipping the priests when taking photographs, but a good guideline is to anticipate between USD$3 and USD$15 per church for tips. 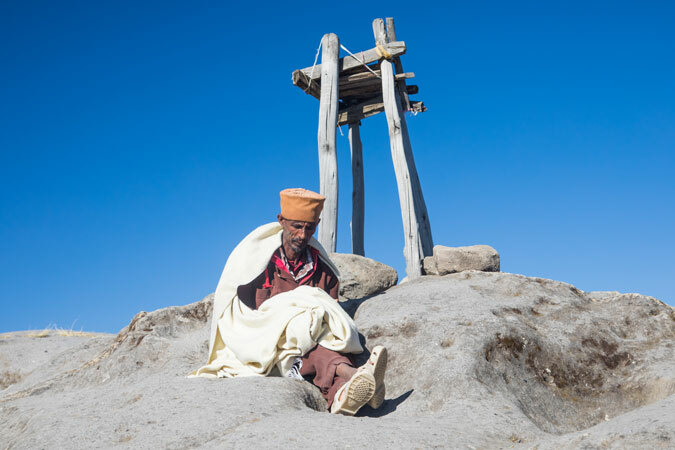 It is common courtesy to ask a pilgrim to take their photo. 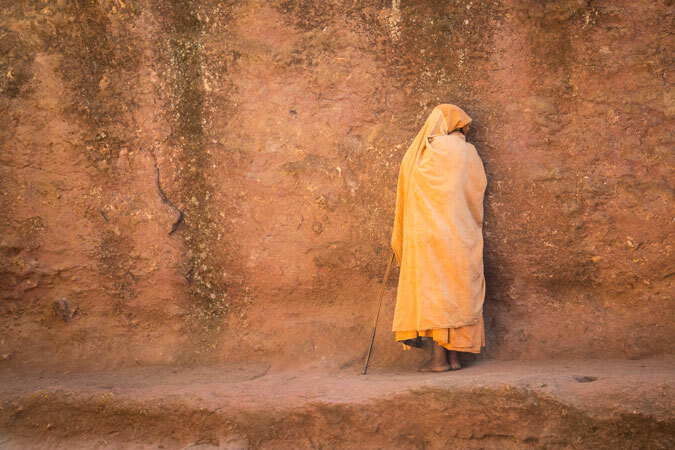 If they are praying with their faces turned to the wall, then discreet photography is generally accepted. Where do I go for the perfect sunset? 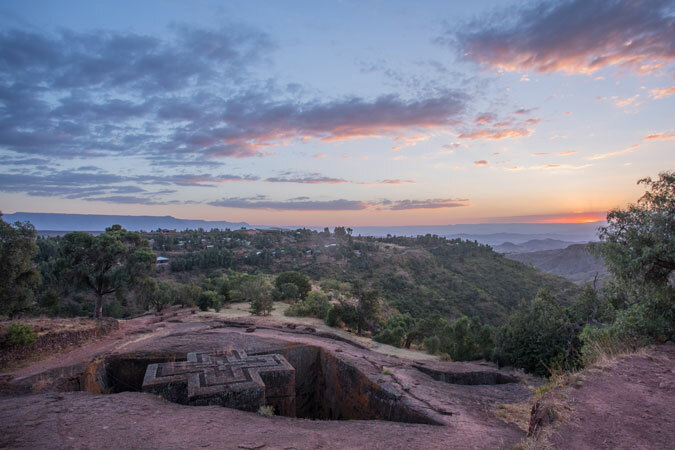 Without a doubt, the uncovered main church of Saint George at Lalibela is the most iconic place to catch the sunset. Plan to visit the church itself at the end of the day when the tour groups leave and the complex closes at 5pm. I’m a photographer, which lens should I use? 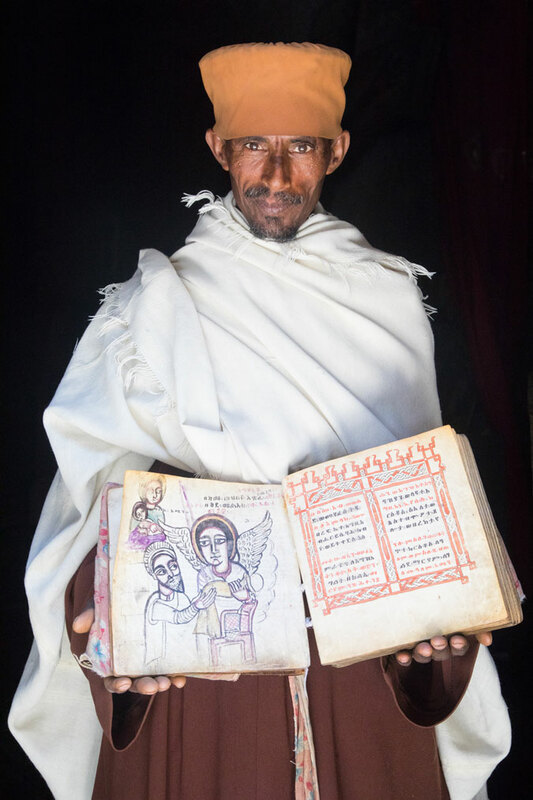 Lalibela is best photographed with two different lenses: one wide angle and another travel lens like the Canon 24-105mm – or a lens with a similar focal length. Can I use a flash inside the churches? In some of the churches using the flash is not allowed, so using high ISO settings is preferred. If you need to illuminate a subject, use a torch and ask the priest if it is okay to shine it on an item. The monastery at Asheten Maryam – is it worth the hike? Yes! 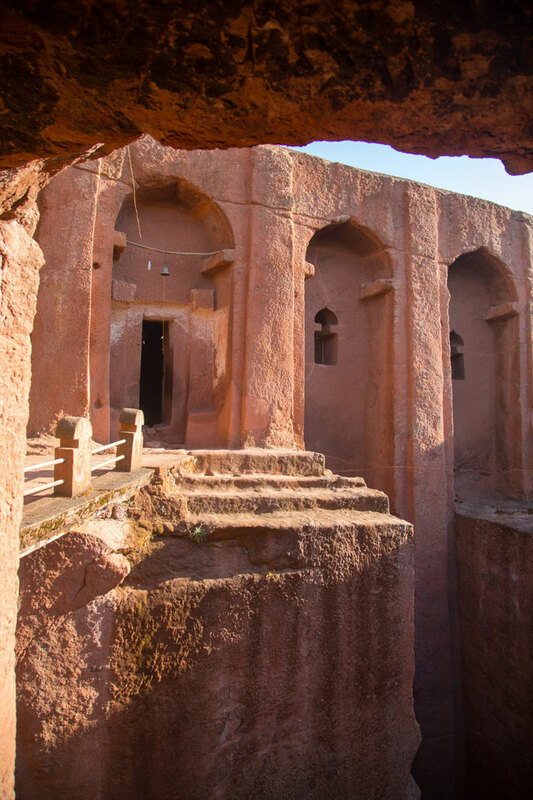 The ancient and isolated Asheten Maryam is located 3150 metres above Lalibela. You can get there by hiking up from the main town, but an easier way is to take a 45 minute car ride to the start of the walk. 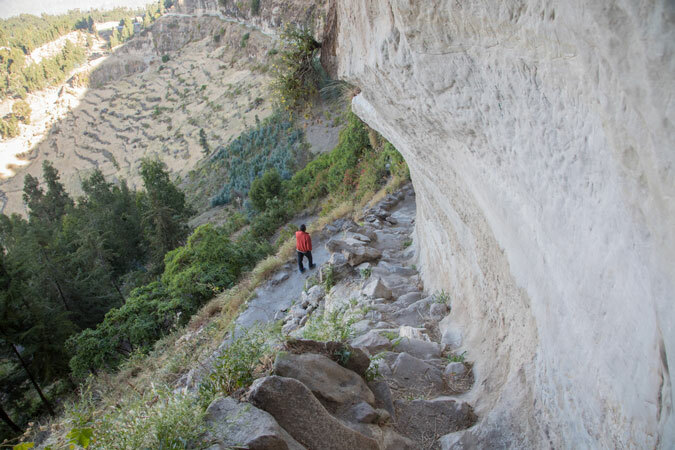 The hike skirts a precipitous cliff but is wide enough to be an easy walk. 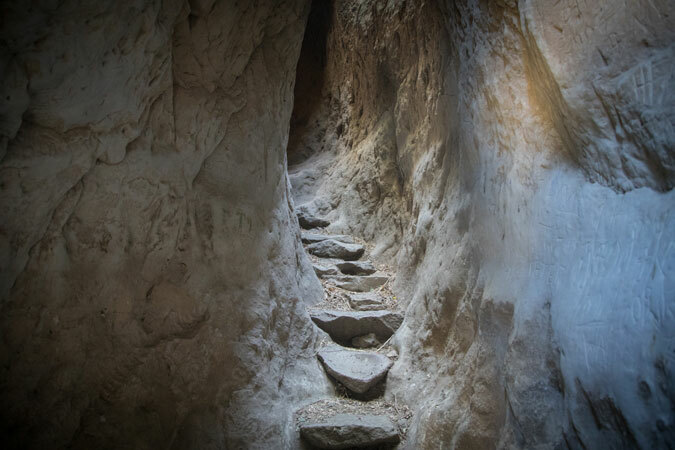 Before you reach the monastery, you have to negotiate a set of hand carved steps in a dark tunnel. 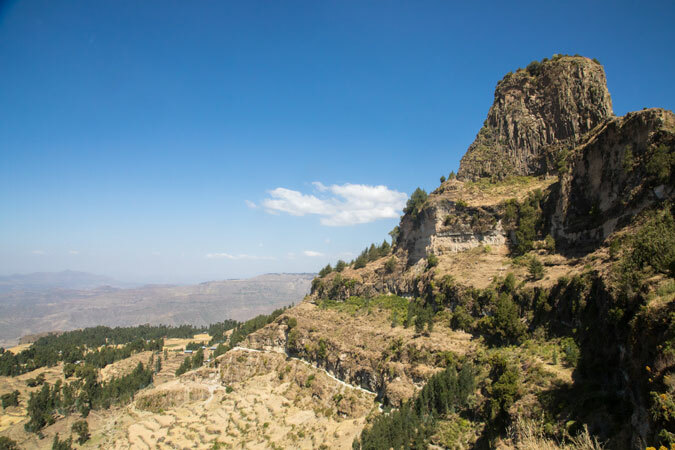 Emerging from that you will be greeted with the most incredible views of Lalibela town. What is the best time of day to visit Asheten Maryam? The mountain has a near 270 degree view so it’s hard to recommend the best time of day to visit. I went at first light but a sunset hike could also be rewarding. If you go at sunset, I would suggest you take a head torch and watch your step if you plan to walk back down the hill when it’s dark. 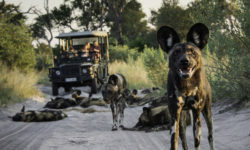 What photographic gear do I need? 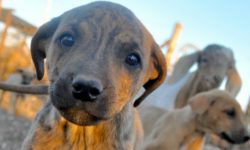 I would take a wide angle and a travel lens. If you can carry it, a telephoto or zoom lens can also be useful as interesting bird life can be spotted along the way. 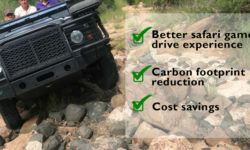 How long does the walk take from the car park? With no stops for photos or breaks, you can do the hike in around 45 minutes to an hour each way. Is there food and water at the top? No. You will need to carry everything with you for the day. What is there to see at the monastery? The view from the monastery is insanely beautiful but don’t stop there! If you go inside the church, be sure to ask the attending priest to show you some of the treasured bibles and old parchment books. 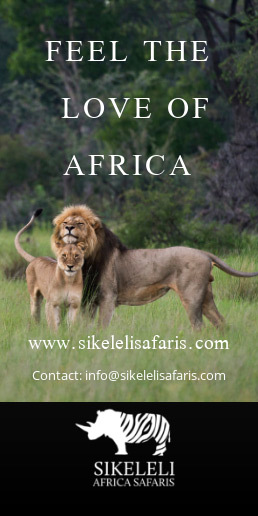 What are some of the things I should look out for at Lalibela? Bibles: The priests are very proud of their bibles in the church and some will happily show you the intricate artwork and depictions. Prayer sashes: You might come across an outside class for children where a priest will be showing them how to paint prayer sashes. These are incredibly beautiful and very brightly coloured. Illumination: Look for light shining through windows and doorways to illuminate your subject. 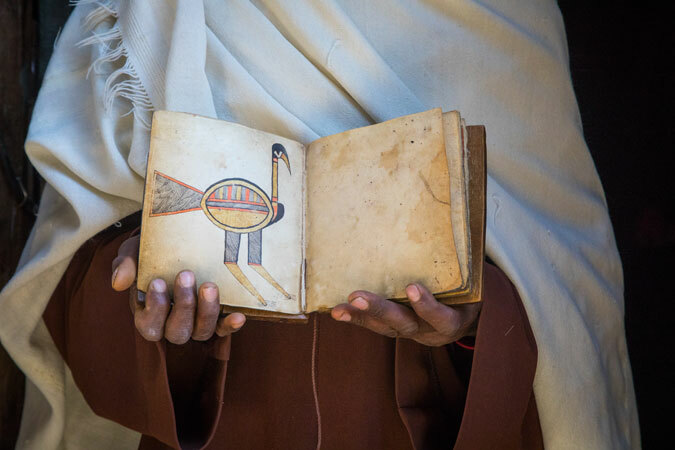 Lalibela is a living, breathing place of spirituality in Africa that is worth taking the time to explore. The tunnels are well mapped but if you get a little lost it is easy to find your way out. At any rate, don’t fret. 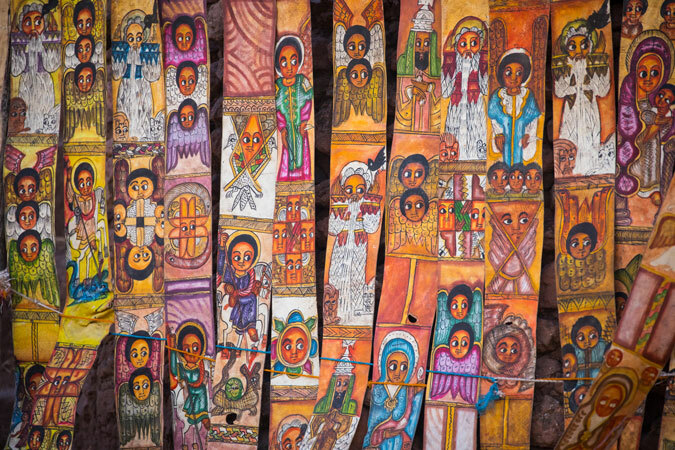 Getting lost in Lalibela might just bring you one of the most memorable experiences of your time in Ethiopia. ‹ Video: criminal porcupine caught stealing!